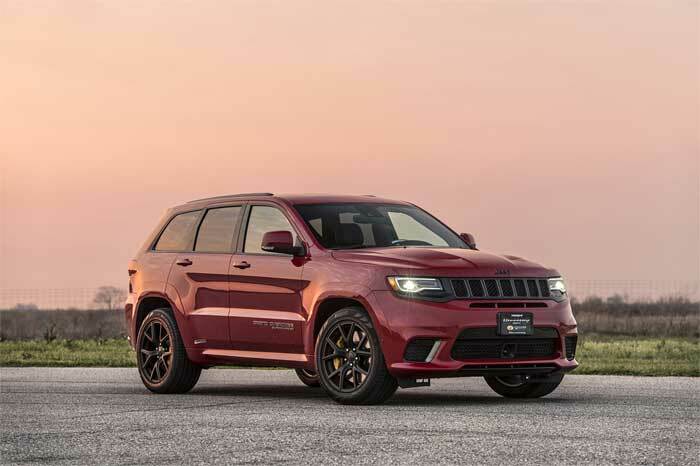 Hennessey has announced that it will be doing some upgrades for the already fast Jeep Grand Cherokee Trackhawk. Hennessey will offer an HPE1000 Supercharger upgrade kit. That kit will bring the power from 707hp stock to 1,012 bhp and 969 lb-ft of torque. That is enough grunt to push the vehicle from 0-60mph in 2.8 seconds. The quarter-mile time for the HPE1000 Trackhawk is listed as 10.5-seconds at 133 mph. That is with a prepped strip, experienced driver, and drag radials out back. The kit includes a 4.5L supercharger with 14psi of boost. Long tube headers, fuel upgrades, and custom tuning are also part of the package. Lots of badging and interior and underhood plaques are included. There is no word on pricing for the upgrade.